Excellent communication skills, both written and verbal, for technical and non-technical clients. Requirements gathering and ad hoc query creation of institutional data at two different universities including federating several data sources. Using a combination of sophisticated ETL processes, web portals, and database views: streamlined process for year-end and quarterly reports to reduce staff burden, made data available more quickly to outside partners, and increased accuracy of institutional reporting. 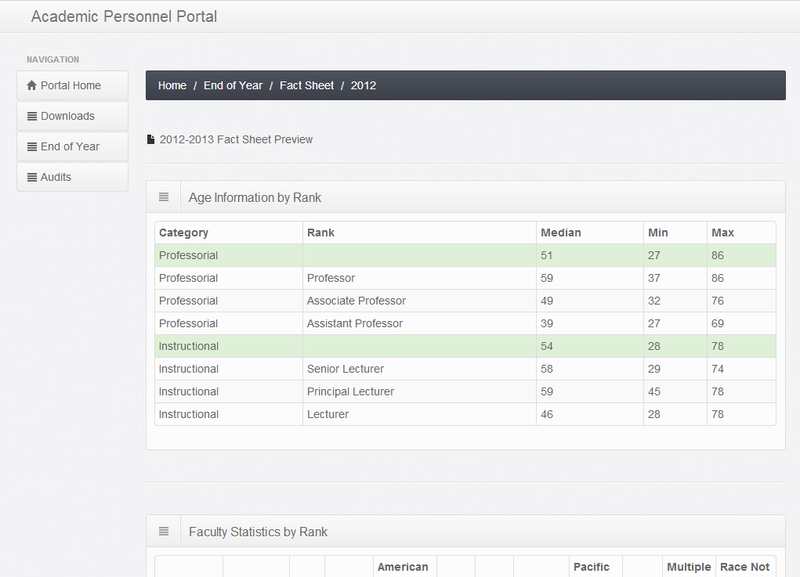 Ability to quickly learn new institutional and application databases to understand data and create reports. Database Administration: responsible for design, security, data dictionaries, and performance tuning of databases receiving thousands to millions of rows a month, using MySQL and Microsoft SQL. Server Administration, both Windows and Linux, standalone and virtual. PHP/MySQL application development since 2003 including WordPress development, the MVC framework Codeigniter, Twitter Bootstrap, JQuery and JSON. Functional testing using Selenium, load testing using Jmeter, unit testing using PHPUnit. Installed, utilized and maintained multi-tier, multi-stage development and production environments. Believes that good code is self-documenting and is also accompanied by comments and external use documentation. Some recommendations are available on my LinkedIn profile. Letter of recommendation for my work at TransNow. Letter of recommendation for my work on a short web contract. Of course, current professional references are also available on request. 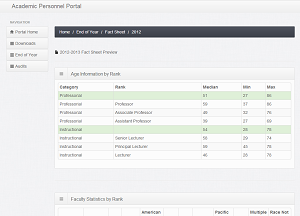 Recreated 40+ end of year aggregated HR data reports for which we had no requirements or source data. PHP, MySQL, CodeIgniter application allows business to view data. Extended portal to include EDW to Prime data comparison, for auditing. Person view page accesses RESTful hrpws using JSON, Curl for real time data. Created a web form to help streamline employee workflow for entering retention data and created reports based on this data. Complete re-engineering of process allowed our team to use a shared dataset for multiple reports. Well-documented process consists of a series of SQL queries to build a draft population from existing sources. Then another series of SQL queries are available to automatically flag potential issues. 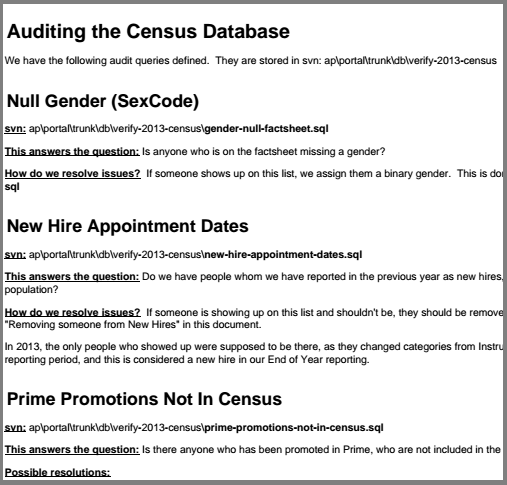 Documentation explains how to correct issues in the report population when found. Shared data views allow AP to share the population with other groups, further reducing data analyst staff burden. Extended RFP application to allow budget tracking from proposal to project completion. Role-based approach allowed PI’s to log expenditures, the director to review and approve budget lines (requirement driven by UW audit), and an anonymized board of directors view for decision-making. Short development timeline required I quickly learn about budgets to determine application requirements. Migrated Excel spreadsheet containing thousands of contacts to MySQL database to allow reasonable mailing list and adhoc query ability. Data cleanup prior to migration was a combination of automatic script-based cleanup and manual staff work done under my direction. Student data (also in Excel) was incorporated in a second release, requiring another round of data cleanup, requirements gathering and templating. Sophisticated search function I built into the web application allowed staff to do their own adhoc queries and download data into Excel. Updated existing web application to make it more user-friendly and robust. Added online review section so that peer reviewers could easily login to view proposals they’d been assigned to review by TransNow staff. 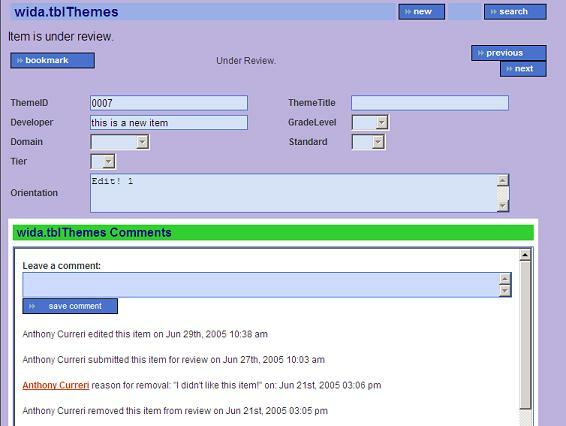 Each year I managed the process to re-evaluate the functionality of the software with stakeholders while reviewing user feedback from the previous year. The iterative process greatly improved my project management abilities as well as deepened my understanding of user interface design. PHP application presents one question at a time and allows for logging or session time out mid-test. Software records time spent on each question, to allow metrics for Medisystems to determine which questions required more or less thought. 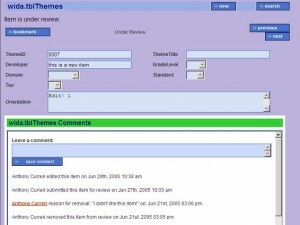 When I started the project, Medisystems had already run out of paper tests, and didn’t want to order any more. I had to create this software quickly, while meeting the needs of an existing contract with another company. Design required the online forms would be easy to alter: achieved with a flat file that describes the form layout, and the software learned about database changes and field types through an automated process using SQL describe statements. Designed all aspects of the web site’s security: SSL, user and password management, and session security. Responsible for design and implementation of the GUI, process workflow, and Sec. 508 usability compliance. Built Perl module to parse firewall logs from the syslog server I configured and load them into a MySQL database. PHP frontend allows the user to enter a timeframe and see pie charts displaying the top 10 attackers, attacked ports, and victims during that timeframe. UWO staff can quickly see problem areas and decide how to address them, turning their web of firewalls into a campus-wide intrusion detection system.